Hire our great value for money caravan, we are 5 star rated on Google and Trip Advisor. We have lots to offer at great prices including free refreshments on your arrival. Our 2015 fully equipped holiday home, a real home from home situated on the most popluar closest to everything. Sleeping 6, (a 7th is allowed if under 2 yrs old) in 1 double and 2 twins. Twin beds can be put together to make doubles, providing excellent family accommodation. 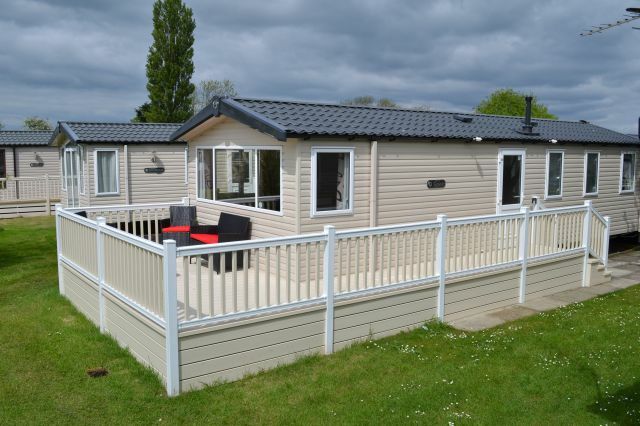 For additional comfort the caravan has double glazing throughout with electric plinth heating to all bedrooms. We are situated on the most popular Willow Grove, minutes waks to the Theme park, Entertainment, swimming complex, fishing lake, golf, shop, reception. On entering the caravan you will be amazed by the modern spacious open plan interior with a dining area set to the side. The comfortable lounge has ample of room for the whole family with a large corner sofa. There is a 32" Smart/Freeview/DVD TV along with a plasma fire. The kitchen is fully equipped with all utensils, crockery, pots, pans, microwave, kettle, toaster, sandwich maker etc. It has a full sized cooker a good sized fridge and separate freezer. The shower room has an extra large double shower, wash basin and heated towel rail. There is a separate WC with wash basin and heated towel rail. A fire blanket /extinguisher CO2 & smoke alarms fitted for your safety. The caravan is personally checked & cleaned by the owners. We Provide all Bedding and bed linen. Outside there is a hard standing parking bay. Gas & Electric is provided. There is a washing machine at the back of the caravan, it also has UPVC decking fitted with a patio set. There are DVDs, books and board games Xbox 360 for your entertainment. Our newest edition this year is WIFI as most phone networks don't work on Flamingo Land. Unlimited Passes are not included in the hire price. You can visit our website via the website icon above.